So, now that we’ve conquered our fear of fennel (I mean, seriously, what do you do with this ridiculous-looking licorice bomb? ), it’s time to move into uncharted, even more delicious territory: salads. This salad is, in a word, irresistible. We dare you to take just one bite. Let us show you how this 30-minute side or entrée is made! This start of this salad show is the fennel – curry–roasted fennel to be exact. It was hard to decide on just one, but for simplicity’s sake, we suggest the Rosemary Tahini Dressing from this Amazing Super Cleansing Slaw. The flavors just work. But, if you’re looking to venture outside of your tahini comfort zone, try this 6-ingredient Vegan Tzatziki! We found that it melded really well with the complex flavor of the curry by adding a nice cooling, refreshing finish. You can’t go wrong either way. Once your fennel is roasted, it’s assembly time. For even more protein, fiber, and crunch, we opted for a batch of our Actually Crispy Baked Chickpeas. To save time, you could also just use cooked (unbaked) chickpeas or grab some already baked at the store. This would make the perfect side to bring along to dinner parties or serve alongside mains like these Mushroom Black Bean Burgers or Sun-Dried Tomato Chickpea Burgers. Leaving the chickpeas off this salad makes it more of a side for two to four people (in our opinion). But to make it an entrée for two, add the chickpeas (or cooked quinoa!) for extra heartiness. For more hearty salads, be sure to check out our Loaded Kale Salad, Sweet Potato Avocado Salad, Curry-Roasted Vegetable & Lentil Salad, Mexican-Inspired Salad Cups with Quinoa & Black Beans, and the Abundance Kale Salad with Savory Tahini Dressing. 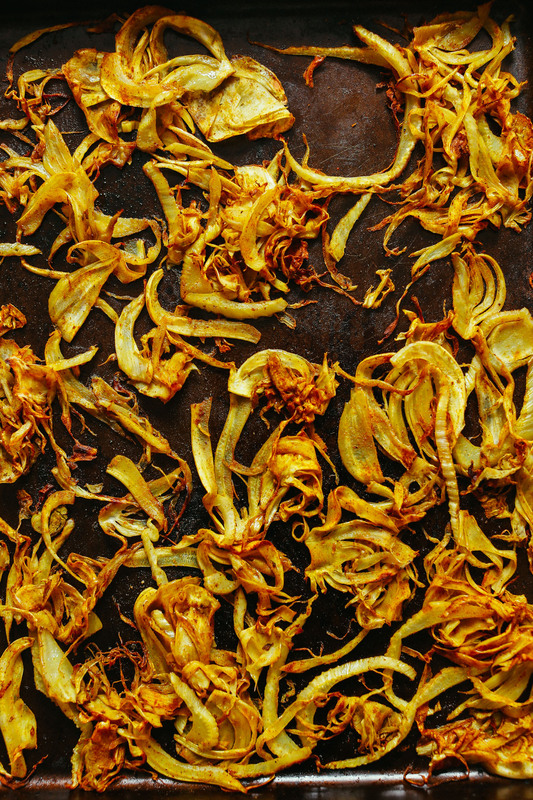 Insanely delicious 30-minute salad with crispy, tender curry-roasted fennel. 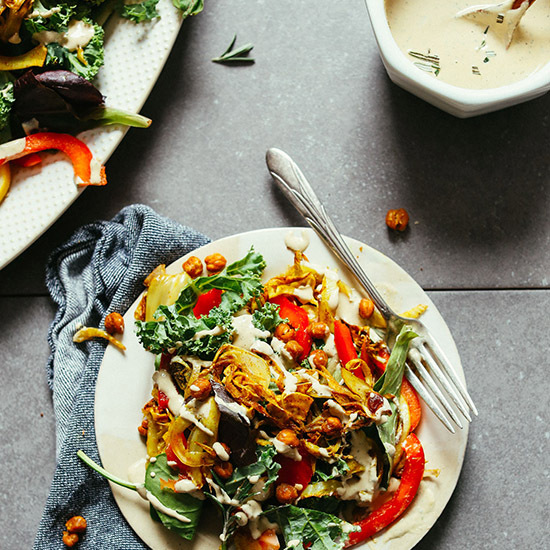 Topped with red bell pepper and a creamy tahini rosemary dressing. Add crispy chickpeas for an optional boost of protein, fiber, and crunch! If serving with crispy chickpeas, follow the link for instructions and prepare now. Otherwise, preheat oven to 375 degrees F (190 C) and arrange fennel on a large baking sheet. Sprinkle with curry powder, coconut oil (or water), and sea salt and toss to combine. Spread in an even layer. Roast fennel for about 20 minutes or until tender, golden brown, and slightly crispy on the edges. Set aside. In the meantime, prepare dressing by adding all ingredients (starting with the lesser measurement of water) to a small blender (such as a Magic Bullet) or a mixing bowl and blending or whisking to combine. Add more water as needed until creamy and pourable. Taste and adjust flavor as needed, adding more garlic for zing, lemon for acidity, apple cider vinegar for tanginess, or rosemary for herbal flavor. 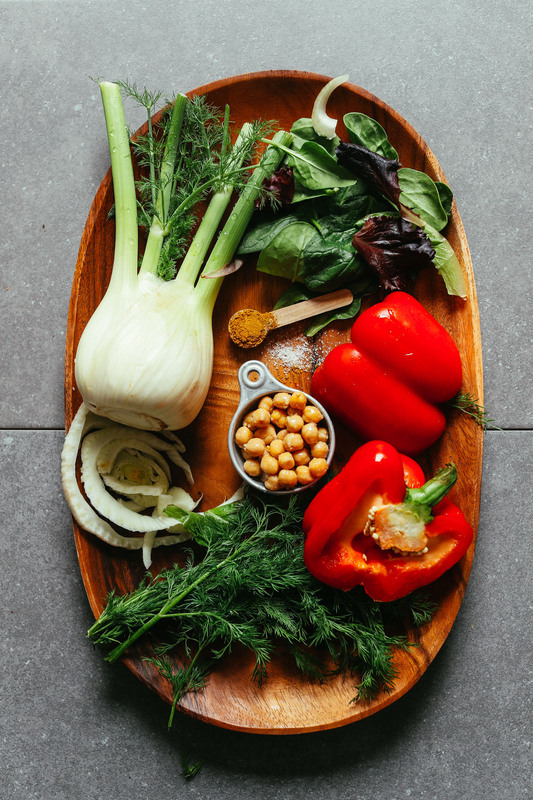 To serve, arrange greens of choice on a platter or serving bowl and top with red bell pepper, roasted fennel, chickpeas (optional), and any additional garnishes, such as fresh rosemary or lemon slices (optional). Serve with dressing on the side. This salad acts as a side without the chickpeas, and more of an entrée with the chickpeas. Best when fresh. Store leftovers covered in the refrigerator up to 4 days. The dressing will keep in the refrigerator up to 6-7 days. 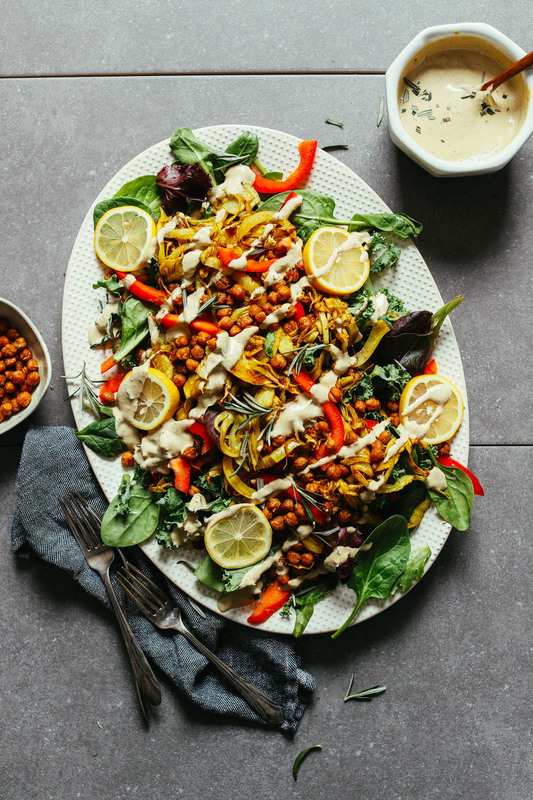 *Nutrition information is a rough estimate for one serving calculated with the oil and all of the tahini dressing, and without any optional ingredients (such as chickpeas). *For a more cooling, lighter dressing, consider replacing the tahini dressing with this 6-Ingredient Vegan Tzatziki. *Dressing recipe from our Super Cleansing Slaw. The dressing on this salad is amazing! (I haven’t tried the salad yet but am looking forward to it. I had needed a dressing quickly and saw this recipe so gave the dressing a try). Twice. It is delicious!! Both times I replaced the fresh rosemary with 1 tsp dried. The first time i thinned out the recipe with 8 TBS water and added a little more water each time I used it to finish up the dressing. Even tasted good thinned out. The last time I used 5 TBS water and used it all up for a larger salad. I used a Bullet for these two recipes and it worked great. Will used a high speed blender when I double/triple the recipe. This dinner was AMAZING! I may have loved the dressing so much I ended up eating spoonfuls of it with the chickpeas…totally healthy right?? 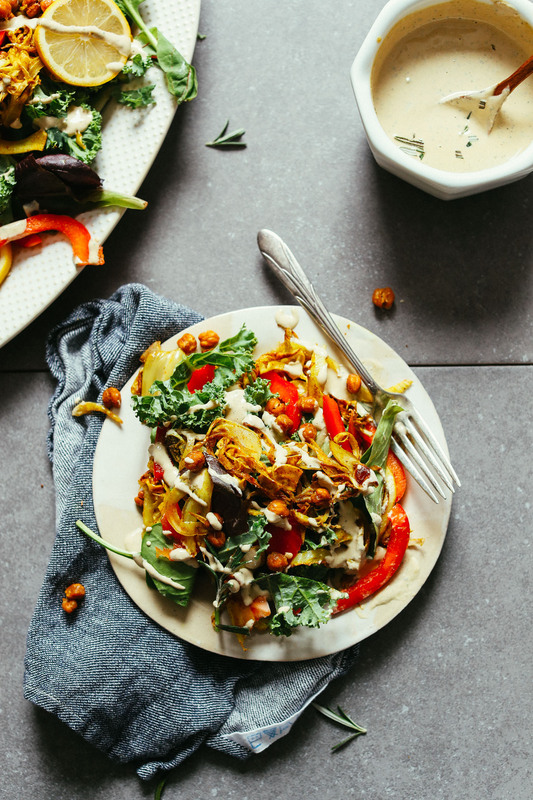 This salad was really nice – an unusual pairing of flavours (tahini, rosemary and curry powder) that I would have never thought of myself but worked beautifully. Thanks for sharing! This was so good! I added roasted curry sweet potatoes and fresh blackberries. I also added a sprig of rosemary to the fennel while baking. Bomb.com. thank you doll! Delicious and versatile! If you don’t have chickpeas make some crunchy lentils or add seeds. I had never had fennel until I tried this recipe and now I make it for my husband and I all the time. Thank you for your amazing recipes!! I’m allergic to sesame seeds – what do you think is the best substitute for tahini? Thank you! Hi Ryan! Perhaps this dressing instead? Whaattt? Who can be afraid of fennel :D try grilling it! it’s delicious that way .. mmm ! Super super good. I made this for my book club and it was such a hit. When I make it in the future, I will double the dressing because I would have liked just a little more and I wouldn’t mind putting it on other things. I cheated and got a bag of Bombay spiced roasted chickpeas from Whole Foods to save a little time and they added great flavor. I already LOVE fennel so it’s awesome to have another recipe to add to my repertoire! Made exactly as directed and it was excellent. Never would have thought to combine a curried vegetable with a rosemary dressing but it really worked. Thanks! I made this dressing tonight for the first time — and it is just amazing. I am adding this to my regular rotation. Yay! Glad you enjoyed it, Jenn! 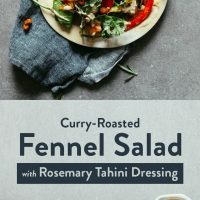 His comment was “different, but I like it!” What he meant to say was that the fennel with curry along with the crunchy chickpeas (also dusted with curry) combined with the light rosemary and garlic flavor in the dressing resulted in a deep, flavorful salad. It was refreshing, because oftentimes I eat salads that are covered with a powerful dressing and the individual vegetables lose their identity and taste. Rolling the chickpeas in a flour sack towel easily removed the skins. And they did crunch up nicely! I can see these being a wonderful snack! Definitely a win win dinner! Thanks so much! LOVE the idea of roasting fennel for a salad. It brings out the most beautiful smell and flavors with anything. I also would love to try the roasted chickpeas–they look absolutely scrumptious! Doubled the recipes and served it for Mother’s Day lunch. Everyone loved it! Will definitely make again. Yay! glad you enjoyed it, Erin! Making this right now and the smell of the roasting fennel is unrealll. Can’t wait to eat it up! Do you have any suggestions about how to use the stems and fronds of the fennel? I’ve never cooked with fennel before so I’m not sure if there are any ways to cook this part, but I’d hate to waste it. Thanks! Hi Cassie! This resource may be of use to you! Thank you Dana! 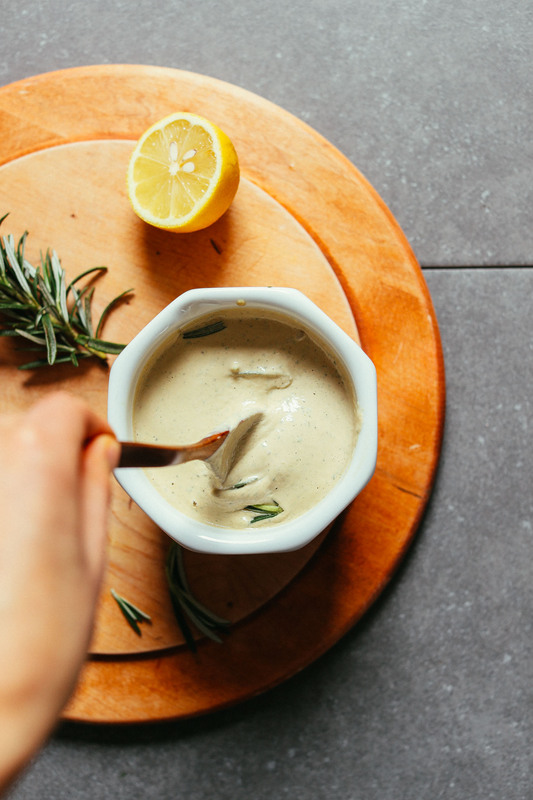 I decided another option would be to douse the extra fennel pieces in the rosemary tahini dressing because that stuff is DELICIOUS and could probably make any root, stem, stick, or edible object taste good ?? Thanks again for all the great recipes! And the utility of this recipe continues! Tonight I cooked 2 chicken breasts in the tahini dressing sous vide 150 F for 1 hr. I then seared over hot charcoal (30 secs ea side) . I paired it with grilled veggies and drizzeld the cooking juce from the tahini chicken bag over the veggies after plating. Thanks for the recipes D. ? i made this (w/chickpeas) and loved it. had it two nights in a row. it was my first time ever to eat or to cook with fennel. the second night i roasted it over charcoal on the grill and followed the rest of the recipe. that was the bomb! the tahini dressing made me cry. i made another batch tonight and put on mixed greens with sauted mushrooms, smoked anchovies, blueberries, and salt and pepper pistachios. Love love love. Easy to make. I actually roasted the chickpeas with curry and avocado oil and left an additional 10 minutes. It was a total hit! Glad you enjoyed it, Karen! Loved this salad which I made for the first time. The dressing would might be better with one less garlic clove. Otherwise, the salad was delicious!! Yum yum ! Made it tonight ?? Just made this for dinner and it was incredible!! Really!! Glad to hear it, Gail! Made this tonight for dinner for the two of us. Quite a hit. I paired it with braised tofu slices, marinated in oil, lemon, rosemary, and garlic, to riff off the salad. The curry roasted fennel was different but not unappealing. It’s a flavor profile that’s not, I think, a standard American one, but it was a nice change and we liked it! Yay! Thanks for sharing, Carolyn! Oh wow. I will no longer walk by Monsieur Fennel and wonder what to do with him. Thank you Dana!!! This sounds super yummy….you rock…what an innovative salad idea you got…. On that note let me tell you…I am a librarian…and I have got copies, and copies, added of your newest, and even earlier books, in my Library catalog. You are popular, Lady!. Enjoy the patronage from all of us here.. and my patrons at my library. Of course, this recipe gets mad on my kitchen-counter tomorrow. So excited to try this tahini dressing!! Looks so good! Tahini on everything please ? ?